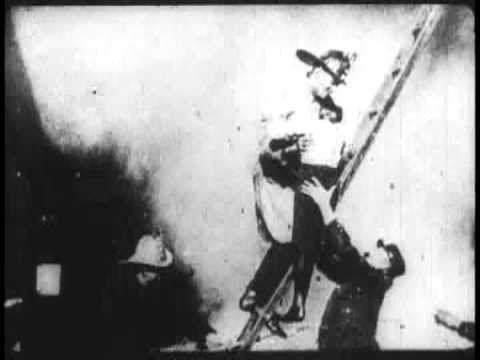 This Kinetoscope short may be considered for the title of “the first disaster movie.” Apparently shot in the Black Maria, it gives us a tableaux of three firemen saving children from a burning building. We don’t see the fire truck or the building – just a ladder. Someone offscreen hands the children down to the fireman on the ladder from above, and he passes them along to one of the men on the ground. Smoke is billowing all around him, which makes it difficult to be certain it was shot inside the studio, but I think it was. It’s worth noting that in the late nineteenth century volunteer firemen were often idolized as heroes and seen as appropriate centers of dramatic narrative. The opportunity to show them in action was no doubt a draw for the kinetoscope parlors. With this review, I have now completed all the movies made before 1895 that I know about and have access to. So far as I know, the others on my list are lost, although of course I am always finding more. As this project has progressed, I have discovered literally hundreds of century films I did not know about when I started, and I keep hearing about more. Even if I were to only go up to 1915, there would probably be more than I could watch and review in a lifetime. Nevertheless, I enjoy continuing to fill in the gaps as I watch more movies from the early period on up to the century mark. I invite you to follow me on this journey as it proceeds.